Aggregation of Eocaudina septaforminalis sclerites from Boczarowski (2001). Scale bar = 200 µm. Echinoderms are a dream group of animals for invertebrate palaeontologists (that's palaeontologists who study invertebrates, not palaeontologists who are invertebrates). Their calcified skeletons mean that their fossil record is extensive and detailed. When most of the body is covered in plates, looking at the fossil can give you an instant idea of what the animal looked like when alive. But as with all things in biology, there are notable exceptions. The sea cucumbers are one group of echinoderms that has significantly reduced the original skeleton, sacrificing a hard outer skeleton for increased flexibility. Instead of solid plates, the sea cucumber skeleton is made up of many minute sclerites embedded in the skin. And while this may be all well and good for the sea cucumber, it is not so convenient for the palaeontologists. In the fossil record, these minute sclerites become separated, and one separated sclerite does not tell you much about the appearance of the sea cucumber as a whole. As a result, palaeontologists looking at sea cucumber remains have found themselves presented with a conundrum. The classification of modern sea cucumbers is largely based on features of the soft body that are usually not preserved in the fossil record, making comparison of living and fossil cucumbers difficult. Also, the skeleton of a single sea cucumber may include different forms of sclerite, performing different roles. If two different types of sclerite are found close together in the fossil record, did they come from a single sea cucumber or from two different sea cucumbers that died close together? To bypass these barriers, palaeontologists have often used what are referred to as 'parataxa'. A single type of sclerite is treated as a single 'parataxon', with the recognition that there may not be a perfect correlation between the parataxon and the theoretical taxon that it originally came from. Individual calclamnine sclerite, Priscocaudina crucensis, from Boczarowski (2001). The Calclamnidae has been recognised as one such 'parafamily' of sea cucumber sclerites. As defined by Frizzell & Exline (1966), the Calclamnidae grouped together rounded or polygonal sclerites that are perforated with holes like a sieve, and that don't have any sort of stalk or other ventral protrusion. 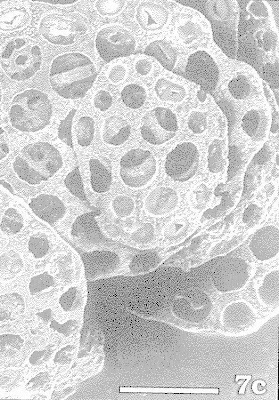 This is a very common sort of sclerite for echinoderms: 'calclamnid' sclerites have been identified as far back as the Ordovician (Boczarowski 2001), and sclerites of this sort are still found in sea cucumbers today (just to confuse matters, the skeletons of some brittle stars also include very similar sclerites, raising the spectre of misidentification). 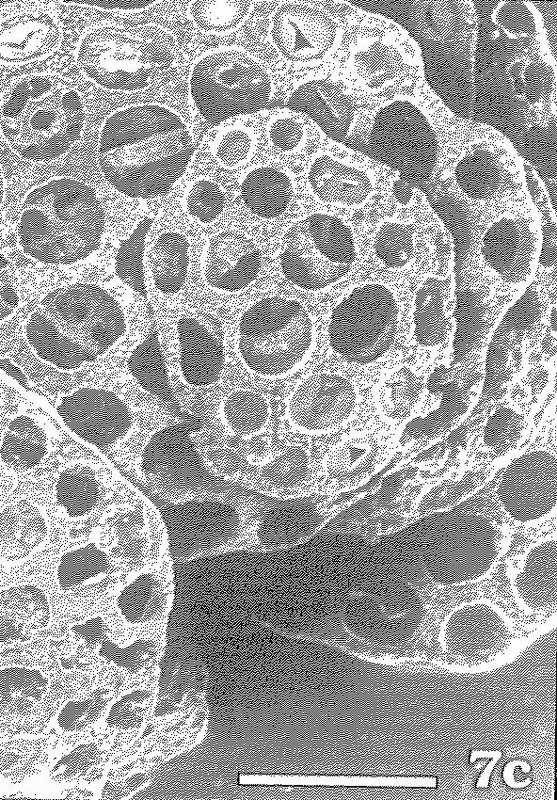 Boczarowski (2001) recognised two subfamilies of Calclamnidae: in one, the Eocaudininae, the perforations of the sclerite are all more or less even in size, while in the other, Calclamninae, the pores towards the centre of the plate are larger and arranged in a cross-shape. The eocaudinines include the earliest calclamnid plates, with the calclamnines appearing during the Devonian. Recognition of parataxa is a convenient tool for keeping records of things like biostratigraphy without getting bogged down, but what sort of sea cucumber did calclamnids actually come from? The calclamnids resemble sclerites found in the group of modern sea cucumbers called the Dendrochirotacea, so they have often been classified with this group. However, a number of features of the dendrochirotaceans, including perforated calclamnid-like sclerites, have been suggested to be primitive for sea cucumbers, so similarities between calclamnids and dendrochirotaceans may represent shared ancestral features rather than true affinities. Haude (1992) commented on a number of cases of sclerites found preserved in assemblages that he believed represented original life associations, including some containing calclamnids. One of these contained sclerites that Haude identified as similar to Calclamna germanica, the type species of the family, in association with large hook-shaped sclerites. Hooks are not characteristic of dendrochirotaceans, but of Apodacea, a different group of sea cucumbers characterised by the loss of tube feet (with the hooks working to provide mobility in their place). Haude suggested the possibility that Calclamna might represent a stem-group apodacean that retained some primitive sclerite features. In other fossil groups such as conodonts, the identification of preserved assemblages has allowed palaeontologists to progress beyond the use of parataxa and integrate more recognition of evolutionary relationships. Hopefully we get the same opportunity with sea cucumbers. Boczarowski, A. 2001. Isolated sclerites of Devonian non-pelmatozoan echinoderms. Palaeontologia Polonica 59: 1-219. Frizzell, D. L., & H. Exline. 1966. Holothuroidea—fossil record. In: Moore, R. C. (ed.) Treatise on invertebrate Paleontology pt U. Echinodermata 3 vol. 2, pp. U646-U672. The Geological Society of America, Inc., and The University of Kansas Press. Haude, R. 1992. 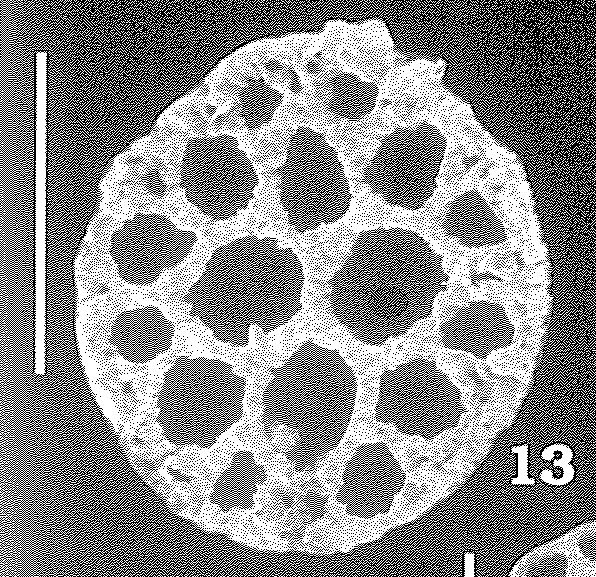 Fossil holothurians: sclerite aggregates as 'good' species. In: Scalera-Liaci, L., & C. Canicatti (eds) Echinoderm Research 1991, pp. 29-33. Balkema: Rotterdam. That is because, though some are stars, none are film stars.